Ten years after Evie Saunders bestowed an aircraft to Tayside Aviation, in which over 260 scholarships have now been completed, Rachel Foyle and Claire Birch are embarking on a special 10-day trip in Evie’s honour to entice more women into the industry. At present, only 12% of UK pilots are female, with the worldwide figure even lower at just 6%. Throughout her life, Evie had a great interest in aircraft and flying but did not take to the air until 1959. In 1985, by then aged 64, she began her studies and flying lessons, receiving her Pilot’s Licence in 1989 at the age of 68. She went on to obtain a night-rating, instrument-rating and twin-engine rating, later becoming fully licensed in each category in the United States as well as the UK. When well over the age of 70, she entered and won a number of flying competitions against younger and more experienced pilots, and was presented with the prestigious Jean Lennox Bird Trophy for the most outstanding British woman pilot of the year in 1992. In 2003, Evie took ill and set out to purchase an aircraft for the benefit of helping young people to learn to fly, confiding only in her niece, Lorraine Richardson. 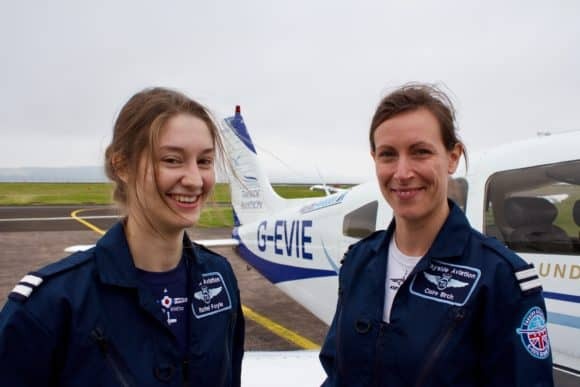 Evie died in 2004 before having the chance to fly G-EVIE, the PA 28 Piper Warrior aircraft she bought but, with her vision to donate G-EVIE as a training aircraft for the next generation of pilots, Lorraine set out to ensure that Evie’s dream became a reality. In 2008, G-EVIE was donated to Tayside Aviation in Dundee, in order to run scholarships on behalf of the Air League Educational Trust. Now, Rachel and Claire are preparing for ‘Evie’s Grand Tour of Britain’ to fly round the UK in G-EVIE. In between flights, the girls will be documenting their trip by blogging at https://eviegrandtour.wixsite.com/taysideaviation, as well as through Facebook, Instagram and Twitter. Being awarded the British Women Pilots’ Association (BWPA) Air Total UK Total Flying Future Scholarship was a great contribution to the funding and feasibility of the trip. The trip has been met with overwhelming enthusiasm, support and kindness by Lorraine Richardson and the various airfields involved in the tour. Pooleys Flight Equipment has also made a generous donation of the equipment necessary for the tour. Rachel (23), a University of St Andrews graduate, began her PPL training at Prestwick aged 16, flew solo later that year and gained her PPL fixed wing licence at 18. Meanwhile, Claire (35) from Buckinghamshire, who began flying at the age of 14 following a gift voucher lesson from her Dad, is a former RAF Navigator who spent 10 years in the back seat of a Tornado fighter including a detachment in the Falkland Islands. Claire then qualified as a PPL fixed wing pilot at Tayside Aviation in Dundee, and has also obtained her New Zealand PPL. Now Safety Officer at Tayside Aviation, Claire is working towards for her Commercial Pilot’s Licence. Evie’s Grand Tour will also allow her to tick off the 450 mile cross country trip which is a key part of her training. Tayside Aviation carry out some 150 Air Cadet scholarships per year and around 30 Air League Educational Trust Scholarships. These are sponsored flying packages to steer young people into aviation. These can range from 12 hours of flying to a full Private Pilot’s licence or support towards becoming an instructor. Subject to change, the trip will go from Dundee – Durham – Syerston – Norwich- White Waltham – Compton Abbas – Bournemouth – Dunkeswell – Lands End – Swansea – Caernarfon – Kirkbride – Newtonards – Prestwick – Oban – Inverness – Kirkwall – Dundee.